Review: Sion Sono is so busy these days that it's almost difficult to watch all the movies he brings out. No less than six movies have been his output in 2015! Because of this he is widely regarded as the new Takashi Miike. And even though Sion Sono's style may be completely different he shows as much diversity as his directing colleague. 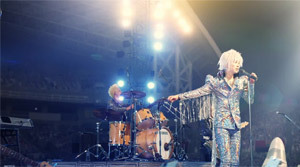 "Love and Peace" is a family movie revolving around the rise of a pop idol, the magic of dreams and the people we disregard while chasing after them, although they are significantly responsible for us being able to make our dreams come true. This time, there is once again more than just one message hidden in Sion Sono's flick and this film was especially dear to him. Yet, this drama also has some not so splendid aspects which are the result of the director not being able to put the amount of time into the movie it probably would have deserved. Actually, it has almost become a part of the director's style that his works are in fact a bit unpolished. His protagonists also lack the necessary amount of elaboration at times. But this seldomly affects his stories in a negative manner. However, in "Love and Peace" it is a source of irratation that can't be overlooked. Ryoichi Suzuki is an incredibly bothersome individual. We really feel sorry for him, being bullied by everyone around him, but then again he also doesn't make it easy for people not to do so. Hiroki Hasegawa ("Why Don't You Play in Hell?") very often oversteps the border to overacting. Only when he becomes a singer he manages to deliver a more or less convincing performance, but then he lacks some real character depth. His initial morbid enthusiasm at least let us expect that there is a fleshed out character behind the facade. The little love story doesn't work since Yuko, embodied by Kumiko Aso ("Casshern"), doesn't bring any credible character traits with her or any at all, to be exactly. This truely doesn't help the film, especially not since the story is told in a very chaotic fashion, too. Furthermore, the talking animals in the sewers can only make you gape in disbelief at first. 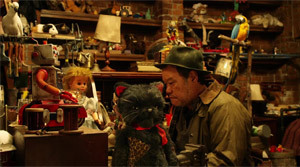 It's true that you never know what you get with Sion Sono - after all, "Tag", which came out the same year, is a gore flick - yet, the plot around dreams and toys that have a life of their own and can almost be called a christmas story is quite a surprise. Moreover, the old man of the sewers commands some sort of magic which origin is more or less clarified later on. And next to that there are also a few Kaiju elements. 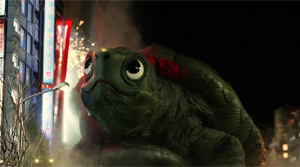 At the latest when seeing the big puppet version of the turtle with its goggle eyes you realize that Sion Sono won't pass on the opportunity of poking fun at the monster genre and let parts of a city be trampled down. The practical effects may be looking a bit cheap and lack the necessary amount of fine-tuning, but they are a better choice than bad cgi effects and also remind us of Jim Henson and Co. Music is also playing a major role and thus there are a few rock ballads to listen to. 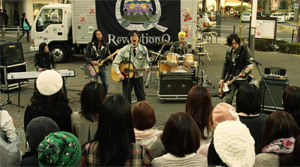 By the way, the main theme of the film was written by the director himself and without a doubt takes the same line of Japanese rockbands whose slightly too corny ballads make women flock to concerts. So what we get to see makes us presume that there is some sort of criticism on society and a message delivered, too. This clearly even starts with the misunderstanding surrounding the content of the song which leads to Suzuki's big breakthrough. 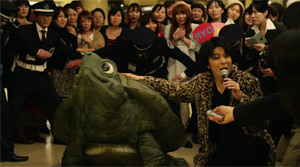 Being an admirer of Sion Sono's work it's easy for me to find words of praise for the director's creativity. But even though "Love and Peace" may be highly praised by critics and in fact is a movie for the whole family - isn't it very rare that you can say that? - I can't help, but criticize the rushed realiziation of the flick. The picture clearly would have deserved some finishing touches. This especially concerns the characters, which remain very shallow and thus can't carry us away emotionally, as is the case with the story in general which hardly lets you make out a red thread running through everything. There are good intentions and I can understand that the motives of dreams and desires and the socio-critical approach by the director will resonate with many viewers, but Sion Sono simply could have delivered something better.